​On Wednesday February 24th, a delegation from the Pennyrile region (advisory council members, senior center staff, and Ombudsman volunteers) representing the interests of senior citizens who need services to stay at home went to Frankfort for a Senior Services Rally. Sponsors of the event included: the Kentucky Association of Gerontology, Kentucky AARP, Alzheimer’s Association, and Kentucky Association of Area Agencies on Aging. In front of the rotunda a standing-room-only crowd of advocates and representatives of the sponsoring organizations spoke of the need for continuing in-home services. These services include: respite, home delivered meals, housekeeping, and personal care services. The case was made for the need to expand the programs to serve the thousands of seniors currently on waiting lists. 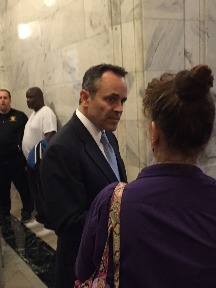 Governor Matt Bevin headlined the group of state government officials who responded to the rally participants.After the rally, the Pennyrile delegation visited the offices of State Senator Whitney Westerfield, Representative Myron Dossett, and Representative Lynn Bechler.